Browse Artists and Groups Adrien Hébert, R.C.A. “Listen to its music, the great symphony created the loading and unloading of grain, the banging of the steel cables, the noise of the winches and the chatter between tugboats and ocean liners” Adrien Hébert, on the Port of Montreal. Adrien Hébert was born in Paris, France on April 12, 1890. He was the son of sculptor Louis-Philippe Hébert and of Maria-Emma-Cordélia Roy. His childhood was spent as much in Canada as in France as his father was commissioned to create a series of bronze sculptures to adorn the facade of the Parliament Buildings in Quebec City. From 1902 to 1911, he attended Montreal's Conseil des arts et manufactures, taking courses from Edmond Dyonnet, Joseph-Charles Franchere and Joseph Saint-Charles; then at the Art Association of Montreal under William Brymner. At the age of 21, he went back to Paris with his father and enrolled in the École des beaux-arts. Hébert returned to Montreal in 1914 and began teaching at the Conseil des Arts et Manufactures. In 1917, he took possession of a studio, which had belonged to Canadian painter Napoleon Bourassa. From 1917 until 1954 he gave drawing classes at the Catholic School Board of Montreal. 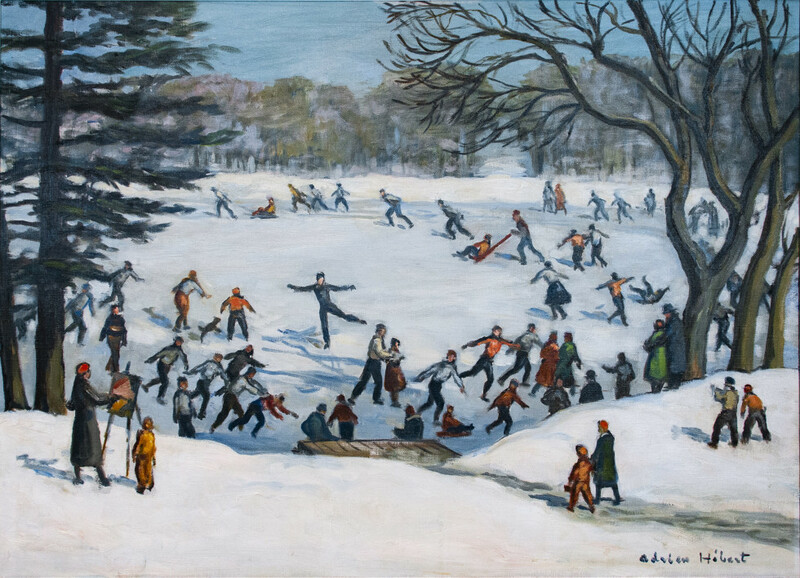 In 1909, Adrien Hébert exhibited for the first time at the Art Association of Montreal's Spring Exhibition, and continued to do so regularly until 1954. From 1910 to 1960 his paintings were shown at the annual exhibitions of the Royal Canadian Academy of the Arts. In 1916, Hébert mounted a show at the Saint-Sulpice Library in Montreal with his brother, sculptor Henri Hébert (1884-1950). In 1919, he had a second exhibition at the Cercle Universitaire in Montreal. In 1922, Hébert went back to Paris where he started experimenting with engravings. He returned to Canada in late summer of 1923 with about forty canvases, twenty-eight of which were exhibited at La Bibliotheque Saint-Sulpice. 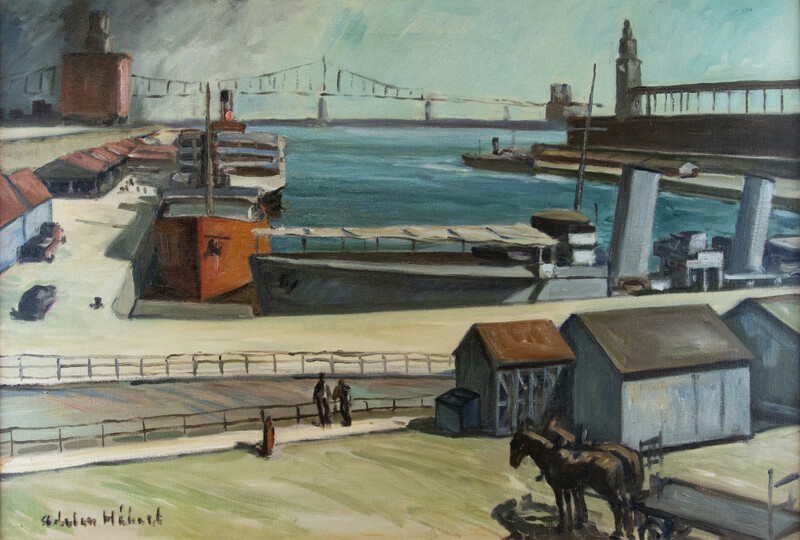 In the 1920s, Hébert developed an interest in painting the city of Montreal and its harbour. He produced paintings which depicted metropolitan streets, often those close to his studio on Rue Sainte-Julie. His paintings depicted images of pedestrians coming and going and of cars and trams travelling down rain-wet roadways or snow-swept streets. He was very taken with the harbour of Montreal - the ships discharging cargo and the dockers working, the beauty of the harbour's architecture exemplified in the huge grain silos and in the footbridges connecting the wharves. In 1931, he exhibited twenty canvases representing his favourite subjects at the Galerie A. Barreiro in Paris. That same year the City of Montreal commissioned him to do a large-scale historical work on the topic of Jacques Cartier arriving at Hochelaga in 1535. In 1932, Hébert was made an Associate of the Royal Canadian Academy. He exhibited at Eaton's in Montreal in 1934, and in 1936 won the Jessie Dow Prize at the Spring Exhibition of the Art Association of Montreal. In 1937, Hébert was named Vice-President of the Arts Club of Montreal and the following year was made President. He became a member of the Montreal Pen and Pencil Club in 1939. In 1941, he was awarded his second Jessie Dow Prize at the Spring Exhibition of the Art Association of Montreal. In 1941, he was made a full member of the Royal Canadian Academy. In 1953, he was awarded his third Jessie Dow Prize by the Art Association of Montreal for his canvas S.S. Empress of Canada. Adrien Hébert died in Montreal at the age of 77. One month after his death, Mayor Jean Drapeau presented one of his Port of Montreal scenes to General Charles de Gaulle on the occasion of the latter's visit to Expo 67. In 1971, the National Gallery of Canada organized and toured an exhibition entitled Adrien Hebert, Thirty Years of His Work, and in the summer of 1993, the Musée du Québec commemorated Hébert with an exhibition dedicated to his art. Please send me more details about the following artist. Adrien Hébert, R.C.A.